Of all of the film genres that Walt Disney's studio regularly produced, the one that is best associated with the studio are the fantasy films. It had been three years since the last fantasy film, Mary Poppins. Based on the book The Gnomobile by Upton Sinclair from 1936, The Gnome-Mobile is the first fantasy film made at the studio since the juggernaut success of Poppins, and is sadly the last one made while Walt was alive. Disney Legend Robert Stevenson was assigned to direct while Disney Legend James Algar took producing responsibilities on this film. Walter Brenan from Those Calloways plays dual lead roles as D.J. Mulroony and Knobby the gnome. Karen Dotrice and Matthew Garber, most famous as the Banks children in Mary Poppins, play his grandkids in their final Disney roles. Other familiar Disney faces include Tom Lowell (That Darn Cat) and Ed Wynn in his final film role. He passed away before it's release on June 19th, 1966. Disney park designer Sam McKim was a production designer for this film. Lots of location shooting was required in Big Basin, California. "The Gnome-Mobile Song" was written by The Sherman Brothers. Disney used the same special effects techniques used in Darby O'Gil and the Little People to make the gnomes small in this film by Eustace Lycett and Robert A. Mattey. Audio Animatronic were used to make forrest animals speak. The film begins with an old car driving through the Red Woods. D. J. Mulroony is the wealthy owner of a lumber company in San Francisco. After picking up his grandchildren from the airport, he takes them on a picnic in a section of the Red Woods forrest that his company owns. When his granddaughter Elizabeth meets a gnome named Jasper while exploring the forest, she introduces them to D. J. and her brother. Jasper needs help because his grandpa Knobby is beginning to disappear, having lost the will to live because they believe they are the last of the gnomes. D.J. has a business trip to Seattle and agrees to let the gnomes come with them so they can look for other gnomes, renaming his car "the gnome-mobile." On their journey, Knobby reveals that the other gnomes ran away because the trees were being cut down. They stop for the night at a motel, where a man named Quaxton is staying, who owns a traveling freak show. When Knobby finds out it was D.J. 's company that knocked down the trees, they get in a big fight and Quaxton overhears. Quaxton kidnaps Jasper and Knobby, while D.J. gets put into a mental institution when he tells his employees about the gnomes. The grandkids work together to drive the car and break him out. After rescuing the gnomes, a chase ensues between the mental institution's goons chase after them. After some evasive maneuvers, their pursuers total their car and D.J. is able to reunite the gnomes with the rest of their kind, where there are many girl gnomes that want to become Jasper's wife. According the gnome customs, the girl picks the guy and a ceremony begins where Jasper is greased and the girl who is able to catch and hold him for seven seconds gets to marry him. Jasper marries the winner, a shy gnome named Violet, and they are immediately married. D.J. deeds 50,000 acres of the Red Woods to them as a gift and offers for any of the other gnomes to be transported with him in his gnome mobile. 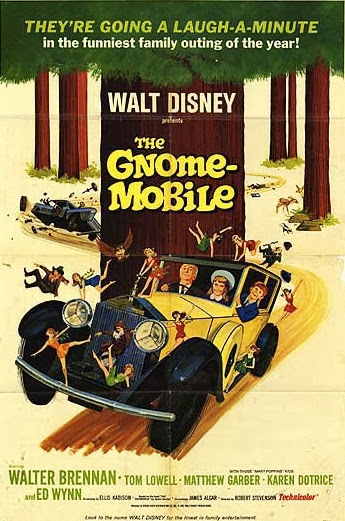 The Gnome-Mobile premiered on July 12th, 1968, and was released on July 19th, 1968. It was a moderate success, making $4 million in its original theatrical release. Critics were mixed on it, praising the effects and performances, but overall felt the storytelling missed its mark. It was theatrically rereleased in 1976 and debuted on TV in 1978. It made its home video debut in 1985. I didn't discover The Gnome-Mobile until I was an adult. It grows on me with every viewing, but it's biggest weakness is that the characters are unmemorable. The highlight of the film for me is the gnome chase with the girls trying to win Jasper's hand. The car chase is fun, but is outdone in later films like The Love Bug and Freaky Friday. The visual effects are very well done, especially a shot at the end with all of the gnomes riding in the car. For those that have seen Darby O'Gil and the Little People, it's hard to not compare the two. Both have their strengths and weaknesses, but the fact that the earlier film became a St. Patrick's Day tradition for many families and TV stations, it is easy to see why this film has faded into obscurity. If you're a Disney fan and haven't seen it, it's a fun little film and you won't regret watching it, but I wouldn't expect it to become an instant favorite. The car and oversized interior set still exist and can be visited at the Gilmore Car Museum in Hickory Corners, MI. Walt Disney was friends with the owner and donated the set to him when filming was complete. The Gnome-Mobile is currently available on DVD, where it is presented in fullscreen with no bonus features. The original theatrical release was in widescreen 1.75:1 aspect ratio. 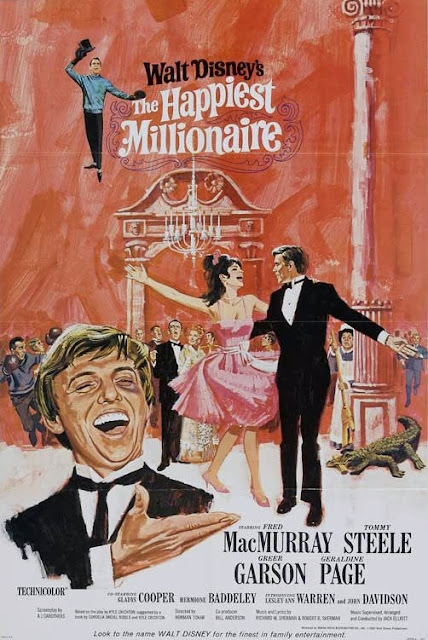 It is also available in a 4-movie collection where it is paired with Darby O'Gil and the Little People, The Happiest Millionaire, and The One and Only Genuine Original Family Band. The film is available in widescreen and in HD on iTunes. It is unlikely to get another physical release (DVD or Blu-Ray), so this may be the only way to get it in widescreen. Walt Disney had made several Western Films, most of which failed to find mass appeal. But this never stopped him from trying. Of the Westerns made during Walt's era, The Adventures of Bullwhip Griffin rises to the top for it's appealing cast and humor. This is not your typical cowboy vs. indians film, but focuses on the gold rush as the setting for a comedic adventure about an out-of-place butler. The source material is a book called By the Great Horn Spoon by Sid Fleischman. Walt Disney wasn't alive at the time of it's release, but it was nearly completed when he passed away the previous December and the marketing for the film says "Walt Disney's." Bullwhip Griffin was the last Disney film directed by James Neilson, whose other Disney work included Zorro, Summer Magic, Bon Voyage, and The Moon-Spinners. Lowell S. Hawley adapted the screenplay, having previously done Swiss Family Robinson and Babes in Toyland for Disney. Roddy McDowall returned to the studio after a small role in That Darn Cat, but this time in the lead role of Bullwhip Griffin. Suzanne Pleshette also returns to the studio following her role in The Ugly Dachshund. Her younger brother is played by Bryan Russell, who was Emil in Emil and the Detectives. And Disney character actress Hermione Baddley, most famous for her role as Katy Nana Mary Poppins, also makes an appearance. Most of the animated visual effects were done by animation legend Ward Kimball. The role of Quentin Bartlett was originally played by Tony Hancock, who was recast with Richard Hayden (voice of the caterpillar in Alice in Wonderland) due to behavior problems on set. All of the interior sets were built on the studio lot and the exterior town was custom built on the backlot. A lot of location shooting was also done around California and at Golden Oak. Matte paintings were made by Peter Ellenshaw and the Sherman Brothers wrote the theme song. The film begins with animated credits and a themed Buena Vista logo. Eric Griffin is a butler for the Flagg family in Boston. After the passing of the master of the house, the family learns that they are penniless which causes grandson Jack to run away to California to join the gold rush. Eric follows after him and gets wrapped up in the adventure, sailing with the boy to San Francisco. On their voyage, Jack meets a man with a map to a secret gold site, but he is being followed by a charlatan intent on stealing the map. Shortly after arriving in California without any money, Griffin sets up a hair cut business and gets into a fight with a thug named Mountain Ox. After knocking him out with a glove full of gold nuggets, he becomes a local legend known as Bullwhip Griffin. The owner of the local saloon offers him $2,000 to hold a rematch at his saloon, which Griffin turns down to head to the gold field. When the crooked man steals the map, Griffin and Jack have to save him from execution to get it back. When Jack's sister Arabella finds out what happened, she too sets out for California. She ends up working as a saloon singer and the boys meet up with her after being robbed. To get some money back, Griffin agrees to the match with Mountain Ox. With a strategy to dodge his blows and tire Ox out, Griffin ends up winning the match through luck and also wins the hand of Arabella. The film ends with the continuation of the ballad explaining how Bullwhip Griffin built the city of San Francisco with the money he made from the fight. 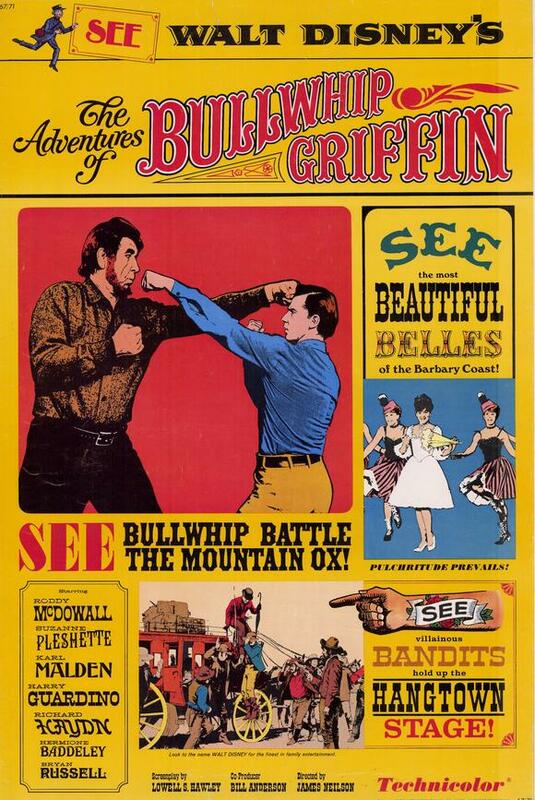 The Adventures of Bullwhip Griffin premiered on March 3, 1967, and was released on March 8, 1967. Critics were mixed on it. Those that disliked it claimed the plot was slow and too drawn out. Those that praised it cited great performances, comedy and effects. It was a box office failure and debuted on TV in 1971. It's home video debut was in 1986. This is one of my favorite Disney films from the 1960's. The lovable characters, tall-tale ballad narrative, and unique comedy is outstanding. On top of Ward Kimball's zany animated interludes, there's a great recurring gag in the first quarter of the film involving a portrait of Jack and Arabella's grandfather. The portrait has a stern face at times, but when something happens that he would find humorous, the portrait has a huge grin. It hasn't achieved the fan base that it deserves, but hopefully this post will encourage others to give it a viewing. The Adventures of Bullwhip Griffin is currently available on DVD. The film is presented in widescreen 1.66:1. This may be the original theatrical ratio, but the standard for Disney during this era was 1.75:1 which is most likely the correct ratio. There aren't any bonus features on this release. The film is also available on iTunes in widescreen in HD and standard definition. It is unlikely to get a Blu-Ray release, so this is one of the few ways to get it in HD.